Home Food 6 Unique Eats in Local Hawker Centres and Kopitiams! Craving for gourmet burgers, Vietnamese pho, and even Costa Rican food? Head on down to the hawker centre - where unique eats await! Singaporeans find comfort in the familiarity of hawker and kopitiam foods – fishball noodles, chicken rice, nasi lemak, roti prata, and so on. But sometimes, your nearest local eateries can be full of surprises! 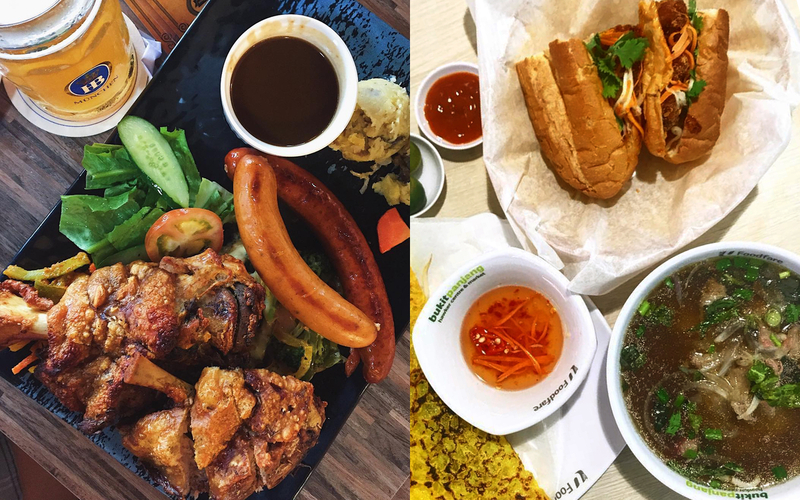 Here are 6 unique eats that push the envelope on what Singapore hawker and kopitiam food can encompass. In a sea of Asian cuisines, one stall at Lau Pa Sat stands out like no other – and that’s Mamacitas! Owner and chef Cindy Castro Vega whips up delicious Costa Rican delights that’s sure to tantalise your tastebuds. Go for a hearty chalupa (fried tortilla bowl with salad, meat, salsa, and cheese), or Cindy’s signature arroz con mariscos (fried rice with seafood). Best known for their German pork knuckles, Otto Berlin Haus serves up a variety of German and western delights, such as bratwursts, rosti, pastas, and beef stew. The food comes in generous portions, which is fantastic for sharing! They also offer a selection of craft beers and ciders to complete your meal with. Looking for a healthy fix? You’re likely to skip the hawker centre, unless you’re in the vicinity of Hong Lim Complex or Bukit Merah Central. At Green Bites Salad, you can build your very own salad from a wide range of fresh greens, toppings, and dressings. Have fun customising your lunch, and get one step closer to your New Year’s Resolution of eating healthier! Who says you can’t have good burgers at a hawker centre? Burgs by Project Warung serves up a wide variety of quality gourmet burgers that look straight out of a posh bistro’s menu, at half the price! Folks line up for their juicy beef brisket burgers and crispy fried chicken wings. Artisanal coffee lovers, there’s now another great option for you – the hawker centre! Black and Gold Coffee Stop brings artisanal coffees and floral teas to Hong Lim Hawker Centre. Choose from their range of flavoured caffe lattes, or complement your hawker meal with refreshing cold brew tea! You don’t have to pack up and fly to Vietnam to satisfy your pho craving – though you might have to walk a little from Pending LRT Station! Saigon Food Street provides yummy, authentic Vietnamese food at a very affordable price – their beef pho is only $2.50! They even have bahn xeo, a savoury pork- and veg-filled pancake, which is quite hard to find in Singapore. Having been to so many hawker centres in our daily lives, we may have expectations of what we can find in these hyper-local eating places. But these 6 stalls turn those expectations on their heads, and bring lots of unique tastes to the diverse hawker scene. At the end of the day, you know what food belongs in the hawker centre? Delicious food, of course. Got good food must share. Share this article with your friends, or check out more recommendations in our Food category! Be a SuperSeed Superhero – be our patron! Previous articleThese Cute Troublemakers Will Have You Cry-Laughing! Next articleChristmas 2017: Sweet Treats You Can’t Miss This Festive Season!